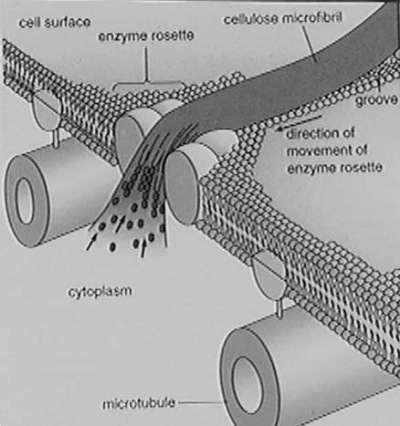 This is a depiction of the rosette TC complex first discovered in our lab in 1980 (Mueller, S.C. and R.M. Brown, Jr. 1980. Evidence for an intramembranous component associated with a cellulose microfibril synthesizing complex in higher plants. J. Cell Biol. 84:315-326. ). From Stephen L. Wolf. "Molecular and Cellular Biology", 1993.